My first experience reading Ellen Hopkins was extremely negative. I thought that Identical was ridiculous and exploitative, but found Crank to be much better. This may be because this book is based on Hopkins' daughter and the central issue is limited to drug abuse. It may also be because I read it on my kindle and was spared the gimmicky formatting of the poetry. Whatever the reason, I enjoyed Crank enough that I am interested in reading Glass and Fallout, which follow the characters in the story. 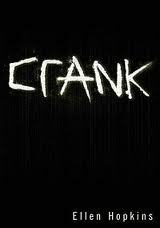 This isn't to say that Crank is perfect. The story hinges on Kristina being a good girl who visits her worthless father in New Mexico and becomes a bad girl named Bree, tattooed, promiscuous, and addicted to meth. Kristina's mother is controlling and determined to have a perfect family, so why would she let her go visit her ex, who is clearly a loser? Also, how did all of this happen to Kristina in ten days? Does every Ellen Hopkins novel feature characters with multiple personalities that require different names? That feels like weak writing that makes it easy to blame misbehavior on the "other" personality, rather than having a character actually make conscious decisions. Hopkins balances her descriptions of Kristina's drug use well. She expresses how amazing the drugs feel to Kristina, yet doesn't glamorize them (except maybe ecstasy), and shows the aftereffects. I wish she had focused a bit more on how meth destroyed Kristina's looks, because I find the famous meth user mugshots to be useful at emphasizing the destructive qualities of the drug, particularly how quickly it works. This is a novel worth reading with your adolescent children. It will be an uncomfortable experience, but will bring up topics that need to be discussed, such as quotes like, "What if the ride was worth it? I mean, who wants to trudge through life, doing everything just right? Taking no chances means wasting your dreams." Crank has joined Go Ask Alice in the canon of cautionary tales of drug use and, after reading it, I feel more informed about what information young people have about meth.